Significant updates will be added to the bottom of this post. Disturbing reports have emerged that a large number of Palestinians have been killed in a shooting in Yarmouk refugee camp near Damascus, Syria. The graphic video above, purporting to be from Yarmouk camp shows a man hiding behind a garbage dumpster, being shot in the head. 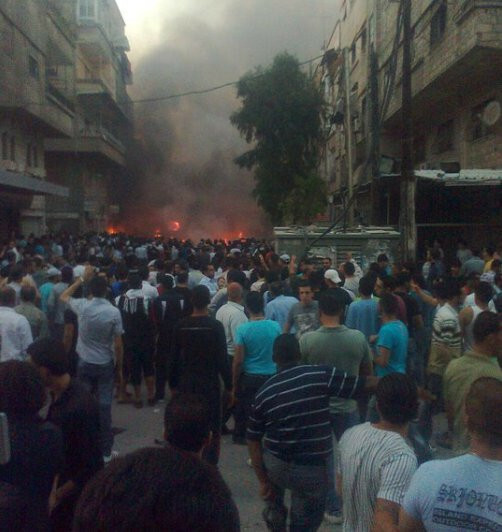 The Arabic caption on the video states: “Members of the Popular Front for the Liberation of Palestine - General Command (PFLP-GC) opened fire on mourners burying Naksa day martyrs killing a number, after some demonstrators burned offices of the Front.” The Electronic Intifada cannot verify any of the contents of the video or the caption. Fourteen Palestinian refugees were reported killed and another 43 injured on Monday, a report from the Palestinian government’s WAFA news said. The victims were part of a massive group in Al-Yarmok, an unofficial Palestinian refugee camp in the Syrian capital of Damascus, mourning the death of between 10-23 Palestinians by Israeli fire on the Golan Heights ceasefire line the day before. Angered over the failure of camp leaders to organize demonstrations marking the Naksa, the anniversary of Israel’s occupation of the West Bank, Gaza, and Golan Heights, an estimated 100,000 mourners were said to have attacked the headquarters of the Popular Front for the Liberation of Palestine - General Command. On his Angry Arab blog, As’ad AbuKhalil reported some more information from his contacts including that the Syrian army was now surrounding the camp. The two videos below also say that they are from Yarmouk camp. The captions are translated for information, and as stated, The Electronic Intifada cannot vouch for the accuracy of their claims. 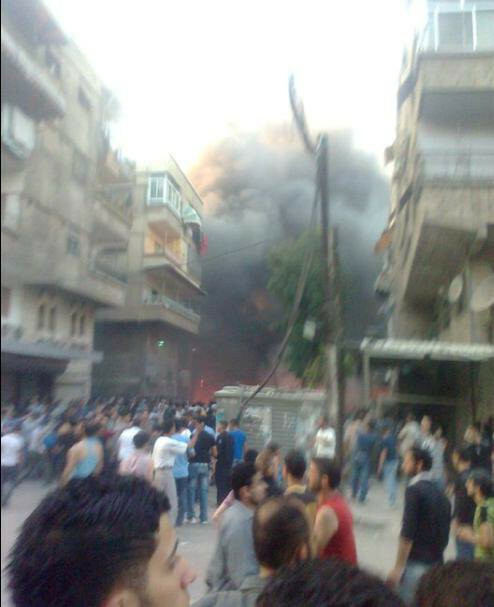 Damascus, Yarmouk camp, gunfire against innocent civilians, 6 June 2011. Pictures posted on Facebook by a Palestinian social networking group called RNN show the PFLP-GC building in Yarmouk refugee camp, Damascus, Syria on fire.